ResMed Quattro Air Parts BUY Quattro Mask Parts, Quattro Air Parts, ResMed Quattro Air Accessories, Full Face Mask Parts, 61721, 61722, 61723, 61724, 61725, 61726, 61733, 61734, 61738, Quattro Air Replacement Parts. Cushion Replacement - SMALL Cushion for Quattro Air Full Face Mask - SHIPS FREE! Cushion Replacement - MEDIUM Cushion for Quattro Air Full Face Mask - SHIPS FREE! Cushion Replacement - LARGE Cushion for Quattro Air Full Face Mask - SHIPS FREE! Frame with X-SMALL Cushion and Elbow with Swivel (no headgear) for Quattro Air Full Face Mask - SHIPS FREE! Frame with SMALL Cushion and Elbow with Swivel (no headgear) for Quattro Air Full Face Mask - SHIPS FREE! Frame with Medium Cushion and Elbow with Swivel (no headgear) for Quattro Air Full Face Mask - SHIPS FREE! Frame with LARGE Cushion and Elbow with Swivel (no headgear) for Quattro Air Full Face Mask - SHIPS FREE! Headgear Assembly Replacement - STANDARD for Quattro Air Full Face Mask - SHIPS FREE! Headgear Assembly Replacement - SMALL for Quattro Air Full Face Mask - SHIPS FREE! Headgear Assembly Replacement - SMALL for Quattro Air for Her Full Face Mask - SHIPS FREE! 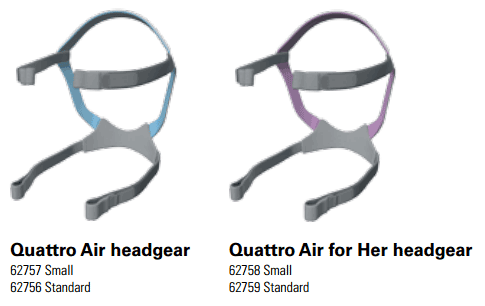 Headgear Assembly Replacement - STANDARD for Quattro Air for Her Full Face Mask - SHIPS FREE! 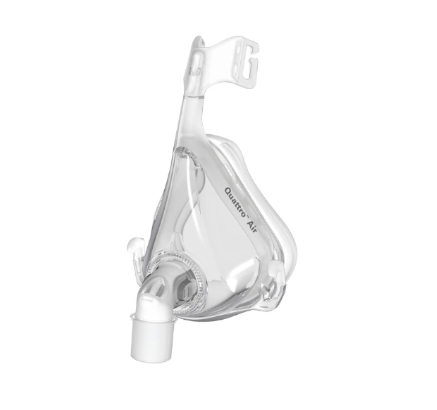 The ResMed Quattro Air Full Face Mask is lightweight with Spring Air technology to be gentle against the nose aiding to a comfortable and restful night's sleep. ResMed is a proven leader in manufacturing CPAP Masks for patients with sleep apnea. The full face mask option is ideal for individuals who breathe through their mouth while sleeping or if their jaw naturally opens when sleeping. Having a full face mask as a backup is also helpful to CPAP users should they become congested or have other sinus issues preventing them to breathe through the mouth. The Quattro Air follows the successful Mirage Quattro which also has Spring Air technology allowing movement while sleeping without compromising the seal around the nose. What sets the Quattro Air apart is it's 45 percent lighter. It has less parts with just the frame surrounding the cushion and elbow with swivel. The ease of set up makes it easy to use and therefore increases patient compliance. The quick release elbow has squeeze tabs to make it quick and easy to attach and detach to tubing. The frame features flex-wing forehead support with a range of adjustments for the perfect fit. You will also notice that its lightweight design is less intrusive for clearer field of vision. When in use, the venting around the nose directs air away to create less impact on both the user and partner. Make sure to add headgear for complete security and stability of the mask during sleep. The SoftEdge headgear is made with premium rolled-edge fabric to not only increase comfort but it also reduces markings on the face. 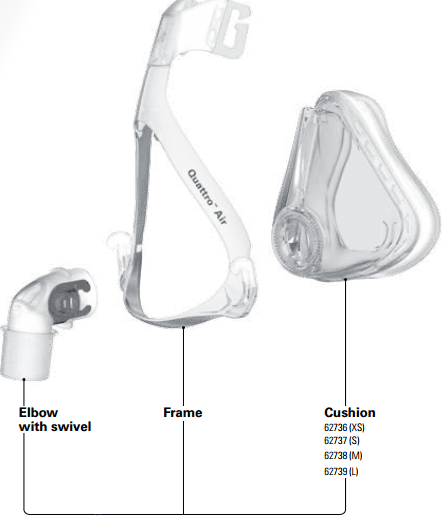 ResMed designed headgear options for men and women.